We farmers, coming from Australia, Canada, Europe, India, Japan, Korea, Taiwan and from Cambodia, gathered to express our solidarity in this global world, to affirm the important role of agriculture in the world, to recognise the dignity of farmers as the feeders of the human community and to ensure the security we need to provide the food. This Farmers’ Dialogue was held in Battambang from November 26th to 30th, 2016. We Cambodian farmers, wish to thank Initiatives of Change Cambodia, Farmers’ Dialogue International, the Catholic Church of Battambang and the Khmer Foundation for Justice, Peace and Development. They have made this Dialogue possible, enabling us to share our experiences, difficulties and hopes as explained below. The Farmers’ Dialogue gathering was officially opened on November 27 by the Deputy Governor of Battambang, His Excellency But Kimsean, who delivered a speech after been welcomed by the blessing dance and by Mrs Sroeun Dany, President of Initiatives of Change Association. Claude Bourdin (France), coordinator of Farmers’ Dialogue International, presented its history. Dr Heng Monychenda, President of Buddhism for Development, gave keynote remarks and finally Father Totet, from the Philippines, gave a brief account of the Catholic Church’s work with the Cambodian farmers. He encouraged the meeting to recognize the dignity and identity of the Khmer Farmers, as they are the preservers of the Khmer Cultural traditions. 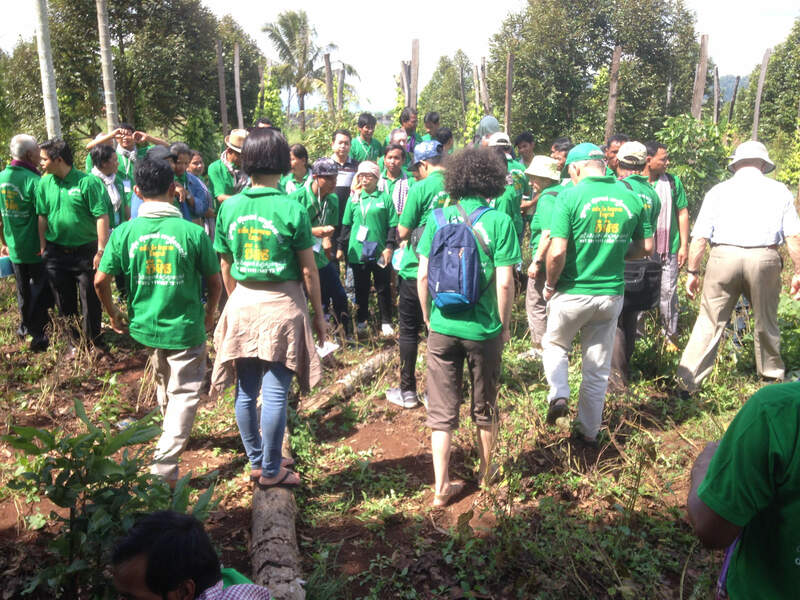 The farmers from Australia, Cambodia, France, Japan, South Korea, Taiwan, presented their respective activities and shared their experiences. The farm visit day (November 28) took the farmers to visit a farm in Samlaut and the vegetable plantation of Hope of Children, as well as the Kam Ping Pouy dam for irrigation, built during the Khmer Rouge period. On November 29, a panel composed of Mr Claude Bourdin, Mr Heng Monychenda and H.E. Pol Ham, Chairman of the National Assembly 3rd Committee on Agriculture, led to the discussion of different topics. H.E. Pol Ham spent most of the session listening to the difficulties, hopes and demands from the farmers, and promising to relay them to the policy-makers. In the afternoon another panel enabled the Cambodian participants to get facts from experts and respond to them on the major issues affecting them. A cultural show ended the day, showing the rich diversity of culture in Cambodia and in the world. Each morning, one hour was dedicated to sharing inspiring experiences of personal change and to inviting all the participants to experiment 15 minutes of quiet time, as a source of inspiration. The last day of the session (November 30) was concentrated on drawing lessons, decisions, ideas and initiatives that grew out of the Dialogue, as a way to demonstrate our commitment to rural development. We farmers, participating in the Dialogue, express also our commitment to look at the future role of farmers in the context of the industrialised and computerised world. The attached 'Farmers’ Charter' gives the spirit and the content of our individual and common commitment. More emphasis on education, especially in agriculture, to attract and train young farmers. We farmers, gathered at Battambang, hope that this Dialogue will be a positive contribution to new and concrete steps of development and will also contribute to a better understanding from the authorities about our problems and hopes. We endorse this declaration read out at our conclusion session on November 30, 2016.